- Any Photo of your Choice Engraved on the Front. Please enter instuctions and engraving message in steps 2 and upload images in step 3. Here you can upload upto 2 images if required. 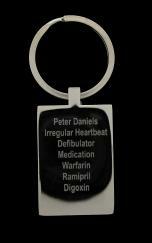 We can then select the most suitable image for your Key Ring. 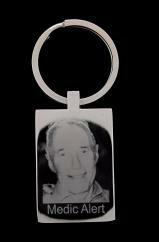 Please bear in mind that the better the image you upload to us the clearer your image will appear on the Key Ring. Take in to consideration Contrast and background. (a lighter background for someone with dark hair and a darker background for someone with lighter hair).